I think it would be neat if you helped me with some art. In fact, it’s more of an interaction experiment; and I’m hoping that you’ll share in the comments your ideas, along with a link to your own blog post around a tree of your choice. I’ll be away for a little while, and I’m curious to see if, when I come back, there will be some more inspiration to finish my own tree. I like to see your ideas, expressions, thoughts, ruminatings, visions, photographs, inspirations, prophecies, recipes, potions, field guides, haikus, short fiction, novels, Whatever. 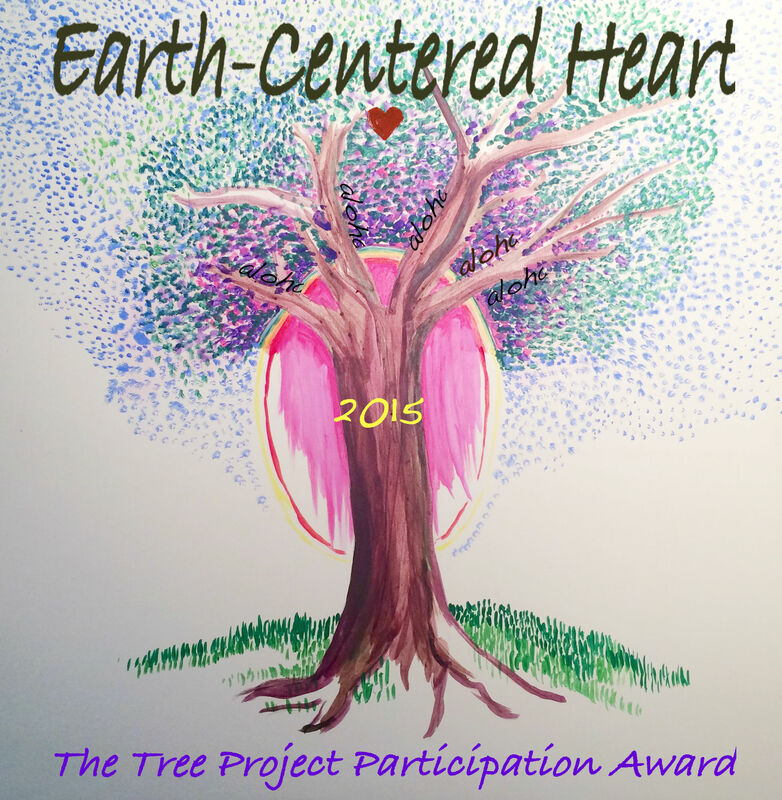 If you participate, I will be very inspired, and I will finish my tree painting and turn it into a badge for you. If I were a mighty tree, I would sway in the wind and receive the rains from the sky. I would enjoy the sun soaking up the rain, and feel peaceful at night when all the little critters have gone to sleep. I would be free from ants. I would look up at the moon, and cherish the twinkle of the stars, and experience the awareness of all my beginnings and endings, from the depth of my roots, to the tips of my fingers and beyond. What kind of tree would you be, if you got to be a tree just now? I would be an ethereal tree, a consciousness that has accumulated from many, many times but can change form, appearance, name, and quality. I would be flexible enough to move through the world. I’d carry my roots with me. I’d open my limbs and leaves one day and the next, I’d wrap them up and bury myself like a fig tree in the winter (such as every year at my grandmother’s house) to rise next spring. One day, I’d be a house plant, another day I’d be a Rainbow Eucalyptus or a Rudraksha tree living on the island Kauai. Then, I’d be a redwood tree with an amazingly shallow but well-connected set of root-systems, connected to all my brothers and sisters, and taking in water from the coastal mists and through my leaves. It really wouldn’t matter to me what form I’d take on – just that I am free to be a the tree, any tree, that I need to be in the moment. If you could choose to make artwork to honor a tree, what format/media/style would it be in? Since I am a tree spirit, I have been around for as long as I can remember, and even longer than that, there’s evidence of me. I would be a fig tree. Large, majestic, drought-resistant — which is another way of saying patient. I would be able to give shade and shelter on a hot, sweltering summer day. I would be able to give sweet fruit to any who would take the time to pick them from my limbs. I saw a video today of a tree that is a hundred years old, and I would like to be that tree — a witness to history. I would make an installation piece that you climb inside, in order to feel what it is like to be a tree. Your feet and toes would be slightly stretched out — not in an uncomfortable way, but in an expansive and yet relaxed way — and slightly moist like roots touching the water underground. Your arms would be drawn upward, also pulled slightly so they are stretched like branches. Small electric fans would blow a slight breeze onto your hands. You could enjoy your tree-ness with eyes closed like a tree sleeping through a night or a winter, tuning in only to the sensations in your roots and branches, and the sound of your trunk and branches gently swaying in the wind. Or you could open your eyes and see (from a variety of screens linked to cameras on the outside of the tree) you could see the world from a multitude of different angles and perspectives. High, low, from the trunk or the branches. You could see children playing tag, birds chirping, old people resting under your branches. Perspective. No wonder trees are so wise. I love it when you show up, so unexpected. I’m wondering if you can send the link to your installation piece. Fortunately, the internet is likely to be forever in existence…. data repeated on servers and duplicated over and over. That means, that, we’ll be able to revisit the shrine anytime we like. As well as… let it be and go with the flow… if you should be so inspired as to make that installation piece. Count me in! If you want to make it small scale… let’s. Que Sera Sera… you know. You rock, Sue! Thank you so much! Here I am again… I didn’t have much work to do for this one as I had already done a post on Trees.. Below is a poem I wrote. What wisdom have you for me today..
Save our trees don’t let them fall. Below is the Link to my own Tree Art.. 4 paintings depicting Spring Summer Autumn and Winter..
Wishing you a creative weekend and looking forward to your finished artwork ..
Nice poem! and as I may have told you, I love your artwork. The joy of art keeps returning. ::hand claps:: laughter in my heart. WOW! Ah, you did see it, I had to read higher up in the notifications. Paint on my friend and give life to majestic tree. Maybe use words as leaves? How’s the Tree Art coming along? Wishing you a wonderful week my friend. Hey sister. I will con tree bute. Let me think on it and get back. Could be abstract but will be tree lated. I love this idea and will come up with something. Let me think about the questions first and I will get back to you soon. I really dig blogging projects and trees have become more important in my every day living. 1- Life would be more expansive and yet simpler if I were a tree. I would just be and all of life would organically play with me. I would always be outside and have lots of companions from the natural world. 2- I would be a large oak, like the one that faces my terrace. Strong, grand, and life affirming, providing shade and sanctuary to many. The elementals would hang out with me and I would seamlessly change and morph with the rhythm of the seasons. “Life is more expansive and yet simpler”: marvelous!… “I would always be outside and have lots of companions from the natural world…” Aw, yes! I like your question about what it would feel like to be a tree, particularly when I think about the really old trees like the sequoias. I love the way time is converted each year into rings, how the memory of an epoch is recorded inside of them in waves. I always imagine them to be stunningly pleasant– silent observers that carry memories of other times and places always close– and accept peacefully all that comes. Wind storms. Snow storms. Squirrel nests. Fungal communication networks. The sound of machinery… I feel also they have a real sense of community. Standing tall together… They’re such beautiful beings. I read one of Paul Stamets books a few years ago, Mycelium Running I think. I’m interested in many things, but don’t know much about Chaga mushroom specifically… Biology has become increasingly captivating as I have learned more about the amazing powers it possesses… I love the book The Rainbow and the Worm by Mae-Wan Ho. Have I mentioned that one to you before? It strikes me as the front wave of a revolution in biology– to integrate quantum physics with the study of living tissue… And Biology Revisioned by Elisabet Sahtouris influenced me when I read it. Life is full of surprises…! I hope your enthusiasm doesn’t wane when you discover this poem was previously posted… I have been traveling this week, and had limited time for new material! I can’t wait to see what comes of the tree painting(s)! We’ll find a home for it…! My enthusiasm hasn’t waned. I’m in the state of processing… Life is full of surprises. I’ll come back with more soon 🙂 Thanks for your comment. 1.If you were a tree, what would life feel like? I think it would feel awesome to be so connected to earth, time, the cosmos, seasons, and all of the elements (earth, wind, water, and fire (necessary for forest regrowth) through an amazing sentient ability that we as humans, in all of our wandering mobility, have grown disconnected from. in a word – I think it would feel powerful. I’d love to be one of the rainforest trees that shelters and supports a whole host of species. I’d love to be an entire ecosystem to these creatures, from cradle to grave, hosting generations of families – plants, lichen, fungi, insects, birds, mammals, frogs, spiders.. you name it!!! They’d be safe with me. Multimedia. Anything gathered around the workshop would work great in creating my art tree. My big themes are abstraction through color and texture. Tactile materials – yarn, ink, acrylic, clay, dyed/torn/crumpled paper (sorry trees)… to show the complex nature of trees, from bark to leaf, would work well. I would then photo this original piece, and make high res prints after different photo processes to get more colors and textures. I’d keep the original and share the prints. I am quit fond of flowering trees like these, Parkinsonia florida (Blue Palo Verde; syn. Cercidium floridum) is a species of palo verde native to the southwestern United States (southeastern California, southern Arizona) and northwestern Mexico (Sinaloa, Sonora, Baja California). Its name means “green stick” in Spanish, referring to the green trunk in which the tree does photosynthesis. I love all trees. Right now in south Florida the most beautiful Royal Poinciana is blooming. She also goes by the names of: Flamboyant Tree, Peacock Flower, and Flame Tree. I took a photo the other day and will use it in a post soon. It has the most vibrant red/orange flowers and you can not take your eyes off of her! Right now I would wish to “flame” like her and stand in my flamboyant beauty, but I’m afraid that a Weeping Willow is more my speed of late. So I stand firmly planted in the ground and the wind blows my long sweeping branches, and you can hear an echo of a cry, a faint whispering moan. I’m so grateful ❤ Thank you, Ka. You gave me something important to think about today, as well! the tree is exquisite and the link to my name is fully operational But why the ? after my name? Will you explain how the diagram fits in or is that off track? That’s a good question. I don’t know 🙂 maybe because purple would have been in it anyway, and maybe because stippling is something that we connected on – and I told you that I enjoy it. I know you enjoy it, too. I’m not sure about Monet? Does that help? Should I have written Monet? and then a link to Monet? What is artful? ❤ Seems there's always an element of mystery no matter how much we know. I'm glad the link works. I checked them, but you never know for sure for sure for sure. I also don't know the answer to your second question, but it all seems on track to me. Namaste. Thank you for your loving and supporting, and dialoguing and being you. I am working on something. It just takes me a while. I love this idea of yours, and look forward to what you create. Wow.. Love it so far, and brilliant how you have linked us all in together.. And HOW on earth do you remember ALL of that stuff!… LOL.. I know when I was in my mid 40’s I joined my daughter back in nightschool at college and did my Massage course.. Learning the skeletal and lympatic system.. along with lots of other things I never thought I would ever remember let alone sit an exam for.. But I did and passed.. So I admire your art, your Mind and your dedication Ka.. I really do.. Haha!.. Wow… Life is really ‘Buzzing’ for you right now in ALL directions, but isn’t that just the greatest thing.. That WE are all of us if we really think about it have no limits.. We can soar and achieve and create and BE and the journey is endless.. This Life is just one aspect where we get to enjoy the physicality and emotions that go with it. So making the most of your moments Ka is wonderful.. And I too am really pleased we connected.. There are so many special people now I am linking into to here via WP.. Learning such a lot from others too along the way.. I am loving your completed Tree Ka… and I think I failed to answer those questions.. But we are as old as the trees if not older 😉 and if I were to be a tree it would be a silver birch, simple because it has so many uses.. but my favourite is the Mighty Oak.. And how would I feel?,,,, At ONE… 🙂 for we all have roots in Mother Earth.. I guess I would like to be a Mammoth Tree, so I can watch centuries after centuries. Great! Thank you for adding your tree here! Your tree badge turned out great!! I like the seasonal changes and ephemeral nature of living things that it implies. Colors are wonderful to behold. Congrats. I also like your ethereal tree answers. Ka! Well done with this post!…. Thank you so much ❤ It really means a lot to get a message from you! Your love is so appreciated. 🙂 I feel very fortunate that you remembered and visited. I'm tuning into myself just now, and delighted to see what shows up…in my art, in my blog, in my life…grateful for your presence here. And it is destined to find and grow roots and more roots in the interconnects. I link my thoughts on the Spirit of the trees here as they resonate with your tree project as well as the post on the Strength of the Grounding :Rootedness . Thank you for your lovely post.and project here. Truly reflects the strength of the interconnects in the interdependence. You are welcome Ka. Best wishes always!